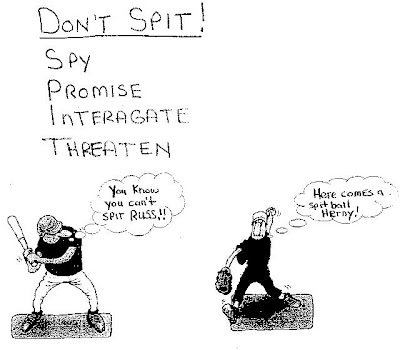 Change FedEx To Win: DON'T SPIT ! * Love offerings: In order to convince employees that they don't need a union, unionbusters may advise clients to provide indirect bribes, like unexpected increases in wages or benefits or ‘feel good’ measures like free food and lottery tickets. * Divide & Conquer: The unionbuster creates opportunities and crafts persuasive messages to make employees feel that there is a tense division among staff concerning the union election. They may go so far as to pit one group of employees against each other, based on race or ethnicity. * Supervisors as Frontline Soldiers: Supervisors, who themselves have no legally protected right to be represented by a union, are manipulated into delivering anti-union letters, speeches, and informal chats prepared by unionbusters, essentially doing the dirty work of the unionbusters and management. *NOT ONE OF THE COMMITTEE MEMBERS WERE ASKED TO SIGN UP FOR THIS SUNDAYS BASEBALL GAMES. I WONDER WHY???? PLEASE LET ANYONE YOU KNOW WHO IS INVOLVED IN ORGANZINIG IF ANY ANTI-UNION PROPAGANDA IS BROUGHT UP.NOT JUST ON THE FREIGHT SIDE,BUT ALSO YOU LTL! IT'S AMAZING HOW THE NEW ATM GOT THIS DONE IN TWO WEEKS! What if my employer doesn't know I am involved in trying to organize a union? If your employer did not know that you were trying to organize a union, then the employer will argue that the decision to fire you could not have been in retaliation for that union organizing. Many employers use this reasoning to escape liability. Especially where workers are trying to organize under the boss's radar, it may be hard to prove employer knowledge of the protected activity. Still, the NLRB will use inferences to deduce who the employer may have suspected. If you were among a select few who had the courage to speak up, that might be enough for a judge to "infer" employer knowledge. Sometimes, the employer's investigation or interrogation of an employee can reveal employer knowledge of the protected activity. To avoid this problem, some union organizers will announce their protected activities. For example, you could send the boss a letter (typically by certified mail) that says, "I plan to start talking with my coworkers about organizing a union." It could describe other protected concerted activities that you plan. This type of letter is called a "revealment" letter because it reveals who is organizing for the union. Certified mail has the advantage of creating a document that shows the date the employer received the item. If the retaliation occurs shortly after the organizing effort (say within six months, or sometimes longer), then the timing alone may persuade a judge that the employer's true motive was retaliation for your union organizing. Can my employer say that it does not want a union? In short - yes, but it must be careful. The company has the right to express its opinions. However, the NLRA has rules that somewhat limit that freedom - companies cannot violate their employees' right to unionize if they so choose. It is often a fine line between expressing a policy preference for no unions, which is permitted, and telling employees they cannot unionize, which is illegal. If the company goes too far to discourage its employees from joining a union, it will violate the NLRA and may have to account for its actions to the NLRB. Companies that do not want unions in their workplace often go to great lengths to discourage union activity, hiring "unionbusters," professional consultants or lawyers who specialize in advising employers on how to thwart union organizing drives or how to decertify unions. Unionbusters usually self-identify as "union avoidance firms," "management consultants," or "labor consultants." Unionbusters help an employer create a sense of dissension and division among employees during an organizing campaign and spread misinformation about the union before workers vote in a union representation election. For more information, see the American Rights at Work page on "Unionbusters." MY QUESTION IS CAN BRIAN CRAWFORD PUT A SIGN THAT SAYS HELL NO UNION? WHEN HE IS DISPATCHING DRIVERS,HE IS SUPERVISING EMPLOYEES,SO THAT MAKES HIM BEING PART OF MANAGEMENT,WHAT ARE THE CHANCE OF HIM RETALIATING AGAINST PRO-UNION DRIVER? Against the union, when his father is in the upper management, sounds like favoritism. What is Unionbusting? The term unionbusting describes the planned course of action to stop workers from organizing a union or to destroy a union already in the workplace. Why Haven’t I Heard of These Firms? Unionbusters operate under the radar intentionally. Unionbusters often provide material and instructions behind the scenes while the employer’s management and middle-management/supervisory staff carry out the actual communications with workers. In this way, the unionbuster does not deal directly with employees and, as a result, may avoid having to disclose financial reports about such activity to the U.S. Department of Labor. The unionbuster’s name or firm is not used or referenced in the anti-union materials distributed to employees, further masking the unionbuster’s involvement in orchestrating the anti-organizing campaign. More importantly, the anti-union company is rarely called on to divulge that it hired a unionbuster or reveal the specifics of such expenditures. Therefore, without a paper trail, unionbusters are hard to detect, underreported, and not in the public eye.